Next, visit Sakkara, is one section of the great necropolis of Memphis and the home of Egypt’s oldest pyramid that was constructed in around 2,650 BC, and is recorded as the oldest major stone structure in Egypt. Admire this incredible, stepped structure as you learn how it was built by the architect Imhotep for the Pharaoh Djoser, and enjoy time to explore at leisure. Three major discoveries have recently been made at Sakkara, including a prime minister’s tomb, a queen’s pyramid, and the tomb of the son of a dynasty founding king. Then, continue to Memphis, Egypt’s ancient capital and administrative center during the Old Kingdom until around 2,200 BC, and is the legendary city of Menes, the King who united Upper and Lower Egypt. Early on, Memphis was more like a fortress from which Menes controlled the land and water routes between Upper Egypt and the Delta. Having probably originated in Upper Egypt, from Memphis he could control the conquered people of Lower Egypt. 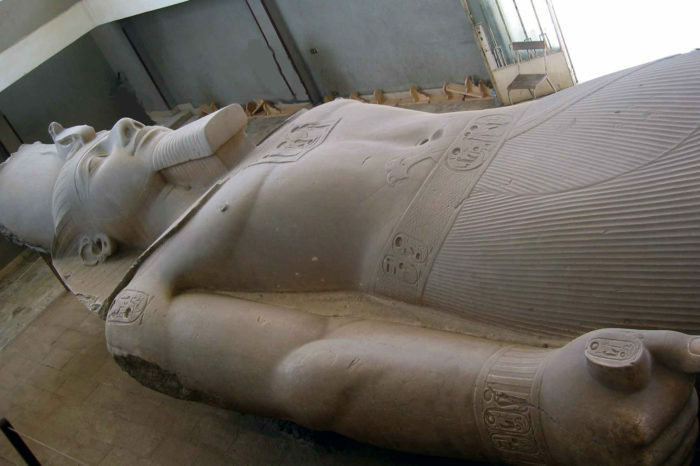 View the UNESCO-listed sculptures and ruins in its outdoor museum, and behold the star turn: a spectacularly large, fallen statue of Ramses II. Lastly, your guide Will transfer you back to your hotel. Next, see the citadel of Saladin (dating back to 12th century) that was built by the Sultan to protect Cairo against potential crusades and remained the residence of the ruler of Egypt till the middle of the 19th century. Inside the citadel you will see the Alabaster Mosque of Mohammed Aly (19th century) representing the Ottoman style of architecture and widely recognized as the most important mosques in Cairo, the Mosque of Ibn Qalaoun (14th century) representing the Mameluk style of architecture, and the panorama area for a wonderful view of Islamic Cairo. Admire the Roman Fortress of Babylon (1st century A.D.), the Hanging Church of Virgin Mary (3rd century A.D.), the Church of Abu Serga (4th century) with the Holy Family Crypt (where the holy family took shelter when they escaped from Palestine), the Jewish Synagogue of Ben Ezra (9th century). Lastly, your guide Will transfer you back to your hotel. Start your lovely day by meeting your guide at your hotel; take your high way from Cairo (about 3 hours’ drive) each way), arrive in the famous city then you will start exploring the city with your tour guide who will explain for you the old history of Alexandria. Your tour guide will talk with your about old Alexandria and the lighthouse of Alexandria, you will visit Roman catacombs of Kom ash-Shuqqafa, consisting of 3 levels for burial rooms which were discovered by donkey in 1901.Head to the Pompey Pillar, the largest pillar in Egypt, listen to many stories about it with qualified Egyptologist tour guide. Then drive to the fortress for Qaitbay locating beside the sea. Finally, you will explore by yourself the famous library (new Alexandria library) which has the fourth rank among the libraries all over the world. Take your lunch at a good quality restaurant, then you will go back directly to your hotel.